This article is about the concept of a trend indicator. For Connie Willis's book, see Bellwether (novel). For the fictional character in the film Zootopia, see Zootopia. A bellwether is one that leads or indicates trends; a trendsetter. The term derives from the Middle English bellewether and refers to the practice of placing a bell around the neck of a castrated ram (a wether) leading the flock of sheep. A shepherd could then note the movements of the flock by hearing the bell, even when the flock was not in sight. In politics, the term more often applies in a metaphorical sense to describe a geographic region where political tendencies match in microcosm those of a wider area, such that the result of an election in the former region might predict the eventual result in the latter. In a Westminster-style election, for example, a constituency, the control of which tends frequently to change, can mirror in its popular vote the result on a national scale. In Australian federal elections, the electoral division of Eden-Monaro in New South Wales elected its Member of Parliament from the party which won government at every federal election from 1972 until 2016, when the record was broken after Labor won the seat, while the Coalition won government. Following this, the Division of Robertson in NSW became the nation's new longest-running bellwether seat, continually won by party that also won government since the 1983 election. The Division of Lindsay in NSW, has elected its Member of Parliament from the party which won government in every Federal election since its creation in 1984. Both Lindsay and Eden-Monaro lost their bellwether status in the 2016 election, both electing Labor MPs, despite a narrow Coalition win nationwide. The Division of Makin in South Australia was a bellwether division from 1984 until 2010, although ceased its bellwether record in 2013, when Makin stayed Labor as the Coalition regained power nationwide. Also, in terms of nationwide two party preferred vote, Eden-Monaro, Lindsay, Robertson and Makin have bucked the bellwether trend in the past by voting Liberal at the 1998 federal election. In purely statistical terms, the state of New South Wales, which has the largest population of any Australian state or territory, could also be considered a "bellwether", as, until the 2016 federal election the party which wins government has won the majority of House of Representatives seats in that state at every election since 1963. Unlike many bellwethers, these are cited by analysts solely for their record and are not usually attributed to demographic factors that reflect the median of Australia. In Brazilian direct presidential elections, the state of Minas Gerais is where the winning candidate took the lead in the last-round election from 1955 to 2018. In the Canadian province of Ontario, Sarnia-Lambton (and its predecessor ridings) voted for the winning party in every federal election from 1963 until 2011. This streak was broken in 2015. St. Paul's has only elected three opposition MPs since it was created in 1935. Also in Ontario, Peterborough has been won by the party who has won the most seats overall in provincial elections since 1977. In Alberta, Peace River has elected only three opposition MLAs since the province was founded in 1905. 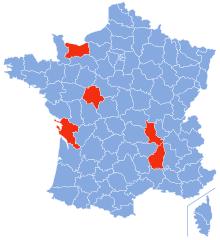 Since the fifth republic president was elected by popular vote in 1965 up to 2017, five departments have always voted the chosen candidate in the second round: Ardeche, Calvados, Charente-Maritime, Indre-et-Loire and Loire. No region has done so in the first round. Since the creation of the Federal Republic of Germany (then West Germany) in 1949, the state where the leading party list vote (Zweitstimmen) matched the party of the subsequently chosen Chancellor more times is Schleswig-Holstein (with two misses: 1969 and 2005), followed by the state of Lower Saxony (with misses in 1949, 1969 and 2005). Both states lie in the North of the country, neither containing many large industrial cities (the biggest being Kiel and Hannover respectively), nor large rural catholic populations, the traditional base of SPD and CDU/CSU respectively. Schleswig Holstein is also famous for having had several state elections result in a one-seat majority for the winning coalition and Lower Saxony's 1998 election (in which Gerhard Schröder was the SPD candidate) is often seen as a "trial run" for the subsequent federal election (which Schröder also won). Both the 1949 and the 1969 elections were rather narrow, the former resulting in a one-vote majority in the election for chancellor and the latter resulting in a 12-seat majority that had broken down due to defections by 1972. Ireland has a proportional representation electoral system, in which politicians are elected by the single transferable vote. Bellwethers here can only be measured by the number of candidates from each side elected to Ireland's multiple-seat constituencies that elect an odd number of members. Between the 1981 general election and 2011 general election, Meath and its successors, Meath East and Meath West, have elected a majority of Fianna Fáil TDs in years when Fianna Fáil formed the government, and a majority of Fine Gael and Labour TDs when those parties formed the government. In New Zealand, there are three generally accepted bellwether electorates: Hamilton East and Hamilton West, both based around the city of Hamilton, and Northcote on Auckland's North Shore. Hamilton West and Northcote missed one election each since they were first contested in 1969 and 1996 respectively — the 1993 election for Hamilton West and the 2005 election for Northcote. Hamilton East, first contested in 1972, has missed three elections — 1993, 1999, and 2005. They were all held by the National Party in the 2017 election although Labour formed the government after the election. Since the National Party was still returned as the largest party in Parliament, however, the two electorates did in fact retain their bellwether status, albeit to a limited extent. In the Philippines, the winner of Philippine presidential election has won in Negros Oriental in all instances since 1935 except for 1961 and 2016, and in Basilan since its creation in December 1973. After Negros Oriental voted for the runner-up in 2016, Basilan's streak that started in 1978 is currently the nation's longest. For vice presidential elections, Pangasinan has voted for the winner in all elections save for 1986 and 2016. Since the 1987 presidential election, the central province of North Chungcheong was the one in which the most voted candidate for the presidency was the national winner. Since democracy was restored in 1977 up to 2015 elections, three provinces have always voted for the winning party (Teruel, Zaragoza and Huesca), as has the Autonomous Community of Aragon, where said provinces are located. Aragon is, moreover, the sole Autonomous Community to have done so. The expression "Som Ljungby röstar röstar Sverige" ("As Ljungby votes, Sweden votes") was coined in the early 1970s, but more recently (2006) voting results in Karlstad, Kalmar and Halmstad more closely resembled the result of the whole nation in elections to the Riksdag. According to Statistics Sweden, election results in Karlstad have been closest to the national results for three consecutive elections, a fact often highlighted by media through Gallup Polls showing voting intentions in the area. United Kingdom constituencies have been subject to frequent review since the late 1960s, particularly those of the House of Commons. Few constituencies are unchanged from one review to another. Therefore, true bellwethers are rare. However, it is possible to match new constituencies to old ones according to the destination of the bulk of the old electorate. The Worcester constituency has reflected the overall result in every general election since 1979. The Stourbridge constituency, and its predecessor, Halesowen and Stourbridge, has reflected the overall result in every general election since 1979. The Gravesham constituency (and its predecessor Gravesend) has reflected the overall result from 1918 until 2017, with the only exception being 2005. The Luton South constituency (and its predecessors Luton East and Luton) had reflected the overall result from 1951 until 2010. The Brentford and Isleworth constituency had reflected the overall result from 1979 until 2015. The Bristol North West and Lincoln constituencies had reflected every result since the October 1974 election until 2017. The Bury North had reflected every result from 1983 until 2017. The Battersea constituency had reflected every result from 1987 until 2017. The Basildon constituency reflected every result from its creation in 1974 to its abolition in 2010. The constituencies of Cunninghame North, Stirling and Na h-Eileanan an Iar have all elected MSPs from the party which won the plurality of seats in the election overall for every Scottish Parliament election. Also, the constituencies of Almond Valley, Dundee City West, Edinburgh Eastern, Glasgow Southside, Kilmarnock and Irvine Valley and Mid Fife and Glenrothes each elected an MSP from the largest party in the 2011 and 2016 elections. This continues the trend that their predecessor constituencies (Livingston, Dundee West, Edinburgh East & Musselburgh, Glasgow Govan, Kilmarnock & Loudoun and Fife Central) achieved in the 1999, 2003 and 2007 elections. Ohio – 2 misses (1944, 1960) from 1896 on (93.6%, slightly "too Republican"), perfect since 1964. Currently the longest perfect streak. Florida – 2 misses (1960, 1992) from 1928 on (91.3%, slightly "too Republican"). Nevada – 3 misses (1908, 1976, 2016) from 1904 on (89.7%, slightly "too Democratic"). Missouri – 3 misses (1956, 2008, 2012) from 1904 on (89.7%, slightly "too Republican"). Was often referred to as the "Missouri bellwether". Donald Trump won Missouri in 2016 by almost 19 points, which suggests it will likely be less of a bellwether state in future elections. New Mexico – 3 misses (1976, 2000, 2016) from 1912 on (88.9%, slightly "too Democratic"). The state of New Mexico voted for the winner of the popular vote in both 2000 and 2016. Additionally these are the only misses in the history of the state of New Mexico since becoming part of the Union. Tennessee – 3 misses (1960, 2008, 2012) from 1928 on (87.0%, slightly "too Republican"). The state has now gone Republican in thirteen of the last 17 elections. Delaware – Perfect from 1952 to 1996, the only state with this distinction. As a result of massive growth and a move to the Democrats in New Castle County, Delaware (suburban Philadelphia, with the old industrial city of Wilmington), the state has become reliably Democratic. Arizona – Perfect from 1912 to 1956. Illinois – 3 misses (1884, 1916, 1976) from 1852 to 1996, the most reliable in this period. As the Chicago metropolitan area shifted to become overwhelmingly Democratic, the state lost its bellwether status. No Republican had ever won the White House without taking Illinois prior to 2000. California – 3 misses (1912, 1960, 1976) from 1888 to 1996. Wyoming – 3 misses (1944, 1960, 1976) from 1900 to 1988. Utah – 3 misses (1912, 1960, 1976) from 1900 to 1988. Montana – 3 misses (1960, 1976, 1996) from 1904 to 2004. Oklahoma – 3 misses (1924, 1960, 1976) from 1912 to 1988. New Hampshire – 3 misses (1948, 1960, 1976) from 1936 to 2000. Colorado – 3 misses (1960, 1976, 1996) from 1948 to 2012. Idaho – 2 misses (1960, 1976) from 1904 to 1988. New Jersey – 2 misses (1948, 1976) from 1920 to 1996. Virginia – 2 misses (1960, 1976) from 1928 to 1988. Was traditionally Republican at the time. Otherwise, the state was traditionally Democratic. Although the 2012 election wasn't included in this bellwether run, Virginia was actually the closest state to the national vote in 2012. Trump, however, managed to win in the next election without Virginia. Kentucky – 2 misses (1952, 1960) from 1924 to 2004. Missouri was often referred to as the Missouri bellwether as it produced the same outcome as the national results in the presidential election 96.2% of the time for the century between 1904 and 2004, only missing in 1956. It did not match the national result in 2008 or 2012, and is considered to have lost its bellwether status. Washington – 1 miss from 1900 to 1956 (in 1912). Texas – 1 miss from 1928 to 1988 (in 1968). Minnesota – 1 miss from 1920 to 1976 (in 1968). Arkansas – 1 miss from 1960 to 2004 (in 1968). North Dakota – Perfect from 1896 to 1936. Kansas – Perfect from 1900 to 1936. Pennsylvania – One miss from 1800 to 1880 (in 1824). Indiana – One miss from 1852 to 1912 (in 1876). Wisconsin – One miss from 1860 to 1912 (in 1884). New York – One miss from 1880 to 1944 (in 1916). It previously had a perfect streak from 1816 to 1852. Had the most electoral votes during the entire period. In addition, the Territory of Guam has had no misses from 1984 to 2012 (100.0%). Guam has no electoral college votes, but conducts a straw vote on local election day. Also of note, from 1996 through 2012, Ohio was within 1.85% of the national popular vote result. Due to the Electoral College system, a bellwether of sufficient size is often also a focus of national attention and presidential campaigns as a so-called swing state that can decide the election one way or the other. As of 2016, Ohio and Florida are seen[by whom?] as the most important swing states and no Republican has won the presidency while losing Ohio and the controversial decision in Bush v. Gore ultimately hinged on a recount of Florida, that – had it gone for Gore – would have swung the Electoral College vote. Iowa has voted for the winning candidate in all but three elections (1976, 1988, and 2000) since 1964. To view full bellwether county list, see List of election bellwether counties in the United States. Vigo County, Indiana (county seat: Terre Haute) – 2 misses (1908, 1952) from 1888 on, perfect since 1956. From 1960 to 2004, Vigo County had been within 3 percent of the national presidential vote every election. In 2008, Vigo County again voted with the winner, but Obama's percentage of 57.3% was about 4.4% above Obama's national vote. In 2012, Vigo kept its streak going, voting for President Obama, 49.5% to Romney's 48.6%. Vigo County continued the trend in 2016, with election winner Donald Trump winning the county 55.1% to Hillary Clinton's 40%; as in 2008, the final percentages were more than 3 percent different from the national popular vote, which Clinton won 48.2% to Trump's 46.1% (The President of the United States is not elected directly by popular vote, but indirectly by the Electoral College). Vigo County is particularly important because it is in Indiana which declares early in the evening, meaning it can be one of the first signs of a winner. Westmoreland County, Virginia (county seat: Montross) – two misses since 1928 (in 1948 and 1960), perfect since 1964. Ottawa County, Ohio (county seat: Port Clinton) – one miss since 1948 (in 1960), perfect since 1964. Wood County, Ohio (county seat: Bowling Green) – one miss since 1964 (in 1976), perfect since 1980. Kent County, Delaware – two misses since 1928 (in 1948 and in 1992). Essex County, Vermont – one miss since 1964 (in 1976), perfect since 1980. Sawyer County, Wisconsin – one miss since 1952 (in 1960), perfect since 1964. Clallam County, Washington – two misses (1968, 1976) since 1920. Stanislaus County, California (county seat Modesto) – one miss since 1972 (in 2016). Ventura County, California – two misses since 1920 (in 1976 and 2016). Merced County, California (county seat Merced) – one miss since 1972 (in 2016). Hidalgo County, New Mexico (county seat: Lordsburg) – one miss since 1928 (in 1968), perfect since 1972. Bexar County, Texas (county seat: San Antonio) – two misses since 1932 (in 1968 and 2016). Hillsborough County, Florida (county seat: Tampa) – two misses since 1928 (in 1992 and 2016). Although its history as a bellwether is shorter than others, the fact that the county is in a swing state and recent demographic changes strengthen its importance. Calhoun County, South Carolina – one miss since 1972 (in 1980), perfect since 1984. Colleton County, South Carolina – one miss since 1968 (in 1980), perfect since 1984. Washington County, Maine – one miss since 1972 (in 1976), perfect since 1980. Juneau County, Wisconsin (county seat: Mauston, Wisconsin) - one miss since 1952 (in 1960), perfect since 1964. In sociology, the term is applied in the active sense to a person or group of people who tend to create, influence, or set trends. The quarterly Bellwether Report, published by the Institute of Practitioners in Advertising (IPA), monitors trends in expenditure in the UK advertising and marketing industry. Look up bellwether in Wiktionary, the free dictionary. ^ "Category:Brazilian presidential election maps - Wikimedia Commons". commons.wikimedia.org. ^ "L'élection présidentielle en France - Politiquemania". www.politiquemania.com. ^ Ihaka, James (13 October 2008). "Eyes on tussle in bellwether seat". The New Zealand Herald. Retrieved 19 September 2011. ^ Shepheard, Nicola (7 September 2008). "Street shows swing voters". The New Zealand Herald. Retrieved 19 September 2011. ^ "Election Resources on the Internet: Elections to the Spanish Congress of Deputies". electionresources.org. ^ a b "Som Karlstad röstar, röstar Sverige", Statistiska Centralbyrån, 6 March 2006. Retrieved 27 March 2017. ^ "Karlstad röstar som Sverige | Forskning & Framsteg | Populärvetenskapligt magasin". Fof.se. Retrieved 2012-03-24. ^ Kondik, Kyle (2016). The Bellwether – Why Ohio Picks The President. Ohio University Press. p. 22. Political scientists have long regarded 1896 as a seminal, realigning election. ^ Kondik, Kyle (2016). The Bellwether – Why Ohio Picks The President. Ohio University Press. p. 23. ^ Sullivan, Robert David. "How Delaware Lost its Bellwether Mojo and Joined the Northeast Corridor". America Magazine. Retrieved 13 August 2016. ^ Everson, David (February 1990). "Illinois as a bellwether: So what?". Retrieved 13 August 2016. ^ Shesgreen, Deirdre (24 June 2012). "Missouri slips from political bellwether status this fall". USA Today. Retrieved 13 August 2016. ^ "Bellwether States and Counties". Uselectionatlas.org. Retrieved 2012-03-24. ^ "Indiana County Is A Presidential Election Oracle". NPR. Retrieved 2012-03-24. ^ Anonymous. "FINAL: VIGO COUNTY ELECTION 2008 RESULTS » Election 2008 » News From Terre Haute, Indiana". Tribstar.com. Archived from the original on 2009-02-15. Retrieved 2012-03-24. ^ Indiana Secretary of State. "2012 General Election". Retrieved November 7, 2012. ^ a b c d Dave Leip's Atlas of U.S. Presidential Elections See individual state presidential results county maps. County maps available without a subscription from 1960 – present. ^ "The Ohio county that picks presidents is leaning Trump". BBC. 2016-07-23. Retrieved 2016-07-23. ^ Herdt, Timm (3 November 2012). "Ventura County voters are nearly flawless in picking presidential winners". Ventura County Star. Retrieved 13 August 2016. ^ CHRISTOPHER, LONG, (12 June 2010). "BEXAR COUNTY". www.tshaonline.org. ^ Reinhard, Beth(June 23, 2012). The Cornerstone[permanent dead link]. National Journal. Retrieved June 24, 2012. ^ In Race to 270, It May Come Down to 106 Counties. Associated Press. Retrieved October 22, 2012. ^ Staff, Investopedia (26 October 2009). "Bellwether Stock". investopedia.com. ^ "How TCS displaced Infosys as the bellwether of India's IT sector". Moneycontrol.